If you’re thinking about buying a ceramic cooktop, here’s what to consider. The glass used for the cooktop surface is very tough and durable, but it’s not unbreakable. If sharp, hard objects are dropped onto it, the glass can be chipped, cracked or broken. The flat surface makes it easy to slide saucepans between elements and on and off the cooktop. But be careful doing this, as you could quite easily scratch the cooktop surface. These scratches won’t stop the cooktop working, but they’ll spoil its nice smooth "new" appearance. Consider the position and layout of the elements and their size in relation to the pots and pans you usually use. Ideally, a simmer element should be at the front, so you don’t have to lean over other elements to stir a sauce. There should also be a large element at the front, for dishes that require high heat and constant attention. Some models also have a dual burner, in which one of the large elements has a small inner ring that can be turned on separately. Knob and touch controls should be easy to grip and well separated, with easy to read (and understand) symbols and markings. These factors are especially important for anyone with a disability such as poor grip or eyesight. Touch controls should be logical and their layout should match the burner/element configuration as intuitively as possible. It’s important that controls aren’t not positioned too close to the elements. If they're close to the front of the cooktop they'll be easy to reach. Keep in mind if you have kids they'll be easier for them to reach too. Touch controls can usually be safety locked but if you’re after a cooktop with dial knobs, controls at the side are safer. Make sure the controls have a good range of heat settings. Continuously variable controls are best at getting the heat just right. Ceramic tops don’t cool quickly, but they do lose colour from the element. Residual heat lights tell you when an element is still hot but not glowing. These lights must be easy to see, even with several pots on the boil. The elements on an electric cooktop should range from around 1.2 to around 2.2 kilowatts. We found some very small inner elements (0.75kW) were a little underpowered for rice simmering. Ceramic cooktops should be cleaned with a glass scraper and a cleaning fluid made especially for the purpose. Most cooktops are supplied with both, and you can buy replacements in supermarkets (the fluid costs about $6 and lasts many months). Avoid harsh, abrasive cleaners and scourers — they will scratch the surface. Manufacturers recommend you wipe up sugary spills immediately, because they can pit the surface if you leave them. Of course, you have to be careful if you’re cleaning a hot plate. Remove sugary spills using a metal spatula or glass scraper suitable for ceramic glass cooktops. Hold the blade or utensil at a 30° angle and scrape the spill to a cool area of the cooktop. Immediately wipe the spill up with a dish cloth or paper towel. Then clean with a soft, damp cloth and ceramic cooktop cleaner once the glass is a safe temperature to touch. Note that because there is often no lip to the top, spills can easily find their way over the side. Ceramic cooktops can quite easily become permanently damaged. Use heavy-based, flat, smooth-bottom pans that conform to the diameter of the cooking area. The best choice is probably a stainless steel sandwich base, or enamelled cast-iron. Some manufacturers warn that aluminium and copper-based cookware can leave metallic stains on the cooktop. 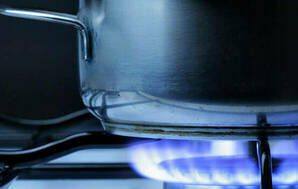 To prevent these building up, you should clean the cooktop regularly — if the metallic stains get burned on to the cooktop’s surface, they may react with the glass and no longer be removable (but they won’t affect the cooktop’s performance). Induction, ceramic or gas? Find out which type of cooktop will best suit your needs, the features to look for, and compare test results for all 3 types.